There are certain key features to look for in shirts for Crossfit. Those features include breathability, durability, and comfort. There are also extra features you may be interested in, such as fast drying material, or a lightweight material to prevent heaviness. Let’s face it, you get very sweaty during a WOD, and fast trying and lightweight material can often make a big difference. Don’t think you have to spend a fortune to get high quality, durable CrossFit shirts either, because that’s not the case. Shop at the right stores and you can find the best CrossFit shirts at very cheap prices. Click here or on the picture above to purchase! If you know much about CrossFit then you’ll know that Rich Froning is THE number one CrossFitter and arguably the fittest person in the world. 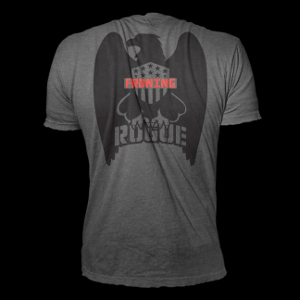 He teamed up with Rogue to design and create a range of great CrossFit clothing, including this shirt. The shirt is more than just great on the eyes. This product has one of the coolest CrossFit shirt designs, making you look super stylish, but there’s much more to it than that. This is a great option for CrossFit clothing for men, or women, as a short sleeve athletic unisex shirt. It’s also made made lightweight, breathable material, which allows you to easily move around during your WOD. Check out this great video of Rich Froning showing off some Rogue’s fantastic collection. This fashionable long-sleeved top has a lot to offer. Whether you’re working out indoors or outdoors, this zip-up CrossFit shirt is comfortable, maintains an ideal body temperature, and allows for maximum movement during all your workouts. With a stand collar and half-zip closure at the front, it’s not only chic and stylish, but also easy to get on and off. It’s one of the best CrossFit womens shirts to wear alone, or to use as a layering piece. Another great feature if this shirt is that it has reflective elements which helps to increase visibility in low-light conditions. That means if your WODing at night and it involves a run outside the box, you’ll be safe from any passing cars! If you’re shopping for CrossFit clothes for women and workout regularly, it’s ideal to find a machine washable shirt, to make it easy to launder. This authentic CrossFit shirt is machine washable and is also available in a wide array of colors. If you’re more interested in funny or cute CrossFit T shirts,this is one of the top picks. We all know that when doing squats, snatches, or clean and jerks, it’s all about GETTING LOW! You can keep yourself motivated and keep pushing harder with this “Get Low” T-shirt, one of the best custom CrossFit shirts you’ll find. It’s a very comfortable, fitted T-shirt that lets you show off your personality when you head to your next workout. If you’re looking for cool T shirts for women, this pre-shrunk, quality t-shirt makes an ideal choice. Amazon has a lot of crossfit t shirts, with some great phrases and sayings, so even if you don’t like this particular t shirt, make sure to check out the other t shirts on offer. 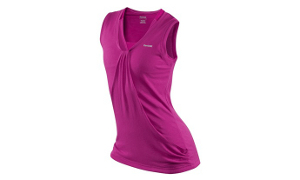 If you want to get performance and style in one, the EasyTone Double Layer Tank from Reebok is the perfect pick. Made of a lightweight poly/cotton mix, the fabric of this shirt is soft and breathable, perfect for any WOD. Whether you’re doing push-ups, jerks, or kettle bell swings, this breathable wicking fabric will help you reach your next PR. Available in a bright, bold fuchsia shade, it provides a stylish, feminine look that makes you stand out from the crowd. It also offers some unique features that differentiate it from the rest of the CrossFit sportswear out there, namely its inner poly spandex layer which features resistance technology, to keep you dry and sweat-free for hours. Moisture is kept away from your skin, so you stay comfortable and dry, and can focus on making the most of each and every workout session. This training jacket by Jaco really packs a punch. With a cool shirt design and the ultimate in style, along with a great price, it’s not one you want to miss out on. With attractive features including a branded zipper pull, fleeced face lining, and a back notch to conform to your shape, it fits your body like a glove. This quality CrossFit clothing is perfect for indoor or outdoor workouts and is easy to get on. It’s ideal for an outdoor WOD during those colder winter months, or simply to throw on afterwards to help cool down. This white CrossFit shirt is warm and durable, but not heavy at all. There are even pockets to keep small items during your workout. Machine washable, it’s simple to throw in the laundry after a sweaty workout. If you want to make the most of your workouts but stay comfortable and stylish at the same time, this Jaco long-sleeved hoodie works wonders. It’s also surprisingly affordable which is always a nice bonus. Shopping for the best CrossFit shirts doesn’t have to be a huge challenge you need to face. These are some of the best options on the market today, but above all you need to make sure you choose the right type of shirt for your body type. For women, you’ll need shirts that are specially designed for your body. These shirts have the same functionality as the men’s shirts, but are better suited for your body and fit more comfortably, such as the Reebok EasyTone tank. An added benefit off this sleeveless shirt is that it facilitates maximum range of motion, which will help you with your double-unders, pull-ups and rope climbs. For those looking for funny crossfit t-shirts, have a look at the many shirts available on Amazon, such as the featured Get Low shirt. Previous post: Zumba Clothing for Sale – We Review the Best Places to Buy!